We do the following: Consultation on what to do to preserve and protect assets; Estate planning and creation of Wills and Trusts; Amendments of Wills and Trusts; Advice on Trust and Probate Administration when somebody passes away; Trust and Probate accounting; Filing of Probate and other court petitions if needed upon death; Litigation concerning Wills, Trusts, Probate and Estates; Conservatorship petitions and accounting; Tax planning and tax returns for trusts and probate estates and related entities; advice on legal and tax consequences of real estate transactions both for trusts and estates and for property not involved in an estate or trust; routine small business transactions including formation and dissolution of corporations, partnerships, and limited liability companies; and asset protection law. 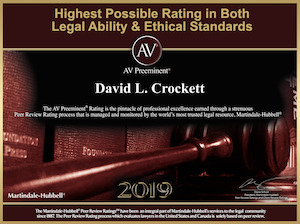 For more than 30 years, David Crockett has focused his practice on estate planning and administration, trusts and probate law, asset protection, and real estate law and transactions. He is a well recognized Orange County Trust and Wills lawyer, an Orange County Estate Planning lawyer and an Orange County trust litigation lawyer. As a graduate of UCLA law school and UC Berkeley school of Business, David Crockett has significant contacts and resources in these fields of law. He uses his extensive experience as a licensed attorney, CPA , real estate broker, and owner and operator of commercial real estate to explain and simplify matters for his clients. He has been retained by many clients over the years and solved a large number of problems in Trusts, Probates, Estates, Estate Planning, Taxation, Asset Protection and Real estate. Many problems can be solved quickly and effectively because Mr. Crockett can cut through the red tape and extended procedural maneuvers often found in this area with a lot less time spent than others with lesser experience. The attorney-CPA dual practice factor. Having dual licenses can vastly simplify otherwise complicated trust and estate disputes and tax disputes. There are only about 1,200 dual licensees in the United States and Mr. Crockett is a member in good standing the American Association of Attorney-Certified Public Accountants. Mr. Crockett is required by law to take 40 hours of CPA continuing education per year and 12 hours of legal continuing education per year. This keeps him up on the latest developments. More importantly, as a dual practitioner, he actually prepares all types of income, estate and gift tax returns each year so he is familiar with all tax forms. This enables him to understand what is going on in any estate, trust or probate situation as there are always tax returns involved. Thus, instead of having to retain accountants to advise on taxes and finances he can explain it and litigate about it as necessary. If the lawyer is not a CPA, then the client typically has to retain a CPA to interpret taxes and finances of an estate, trust or probate situation. If a CPA is not a lawyer, then the client typically has to retain an attorney to interpret the legal documents involved in an estate, trust or probate situation. These types of situations can be handled more quickly and with less expense by having Mr. Crockett as a dual practitioner involved. The attorney-CPA-broker factor. Over his many years of practice, Mr. Crockett has prepared and dealt with nearly every type of legal document, real estate form, escrow form and tax document. So in the context of Estate, Trust and Probate disputes and for real estate deals, he knows what to look for and what to ask for. In the course of trust and probate administration he knows which documents need to be prepared, when they are needed, and where to file them or to whom they must be sent. Will there be federal estate taxes assessed? Will the county property taxes increase? What will the federal and state income taxes be? Example. Here is how this typically comes up in the context of an estate. For example, Mom and Dad pass away and their trust leaves their family home to various people. Will there be estate taxes to be paid and how much and when? Will the property taxes increase and what will the income taxes be if the house is sold? The answers to these questions depend upon the size of the estate, what the language of the trust says and the plans for the house. It also depends upon filing necessary papers with taxing authorities by the legal deadlines. A lawyer without a CPA license may only have limited knowledge of these questions. A CPA without a law license may also have only limited knowledge and will have the client consult with the lawyer. Mr. Crockett as a dual practitioner can typically answer these questions readily so the estate/trust/probate administration gets off to a good start. When do the Heirs Get Their Money? Delays in the administration of estates/probates and trust cause a great deal of anxiety and often lead to costly and time consuming litigation. Some delays are unavoidable. For example, if the estate is not in a trust it will have to go through probate court proceedings to get court approval for transfers of the estate to the heirs. Probate typically takes a year because of legally imposed notification periods and because of the shortage of Judges at the courthouse. Trusts can be finished and distributed in as little as 4 months but typically take much longer. Mr. Crockett’s experience in this area can often speed up the process because of knowing what needs to be done and who has to do it. As a CPA, Mr. Crockett knows how the records should be and how the taxes should be done and can thus make proper specific demands on recalcitrant executors or trustees. If Mr. Crockett is representing the executor or trustee, they are instructed as to what to do, when to do it, and the deadlines involved. As an Orange County Trust Attorney and an Orange County Will and Probate Attorney, Mr. Crockett is experienced in filing court proceedings/lawsuits to speed up the process. Sometimes it takes the filing of litigation to get trustees and executors to do their job and get the estate distributed. Most litigation settles before trial but typically takes many months before everyone comes to their senses and settle. Often, an enormous amount of time is wasted in estate and trust litigation because of petty disagreements and family disputes and greed. As an experienced Orange County Trust litigation attorney, Mr. Crockett tries to focus on getting the money distributed and all records honestly disclosed as quickly as possible so that litigation is avoided or settled quickly. The focus of Crockett Law Corporation is to assist people with their individual living trusts, estates, real estate, closely held businesses, LLC’s, limited partnerships, corporations. All of these types of entities can be formed, amended, planned , analyzed or dissolved or made to be part of some overall estate or asset protection structure. Mr. Crockett’ s decades of education and experience in tax and real estate matters allows him to analyze virtually any estate or asset situation and advise on what is possible to do and how to do it. He can explain and understand, interpret and create virtually any financial, legal or real estate document. Moreover, the tax consequences of any transaction involving money, stocks, other assets or real estate can be determined and explained. Consideration is given on all transactions and documents prepared as to income taxes, estate and gift taxes and real property taxes. Avoidance of litigation-problems to consider in the drafting stages. As an experienced Orange County Trust litigation attorney, Mr. Crockett has seen a multitude of poorly drafted trusts and poorly administered trusts and estates. Thus, when drafting and advising on estate plans, wills and living trusts, Mr. Crockett draws on his litigation experience to determine what clauses and paragraphs should be carefully worded and included in documents when they are being prepared. Not all trust forms are proper or fit for the circumstances. It takes an experienced trust litigation attorney to understand what can go wrong if the wrong forms are used or if the wording doesn’t fit the situation. Taking enough time to get the trust right and proper in the beginning, can save tens of thousands of dollars in litigation fees and costs later on. Please refer to the Practice Areas page of this website for detailed explanation of all of the areas of the law that we deal with.